Coincidentally, just the day after I linked to this Vandana Singh post about human self-absorption and how we blind ourselves to the fascinating micro-worlds of other species, I came across Ranjit Lal’s immensely charming new book Wild City, a collection of short pieces about the incredible diversity of natural life that we can see all around us – even in a crowded, smoke-ridden urban mess like Delhi – if only we make the effort to look. Lal, a keen amateur naturalist for most of his 50-odd years, writes with such fondness and attention to detail about the various birds, animals and insects he encounters that at times one wonders if he lives in an alternate Delhi most of us know little about: a city where it’s possible to attune one’s ears to hear the cry of a lone shikra above the sound of even rush-hour traffic; to be constantly aware of multiple eco-systems, even in the middle of a busy daily routine. The defining quality of Wild City is the sense of wonder that runs through every page. Though Lal is particularly interested in bird species, his affection extends to all sorts of life forms, from squirrels (whom he calls “treetop scolders”) to crocodiles and even such creatures as the predatory spider wasp (which you can apparently find in the recesses of an old music system that hasn’t been dusted in weeks; must check sometime). His writing style is friendly and conversational – even in the essays where he isn’t doing much more than describing the nesting habits or evolutionary history of a particular species, he sprinkles his prose with colourful analogies, so that the story becomes much more immediate than a zoology lesson. The squabbling of a gang of jungle babblers is likened to “an edition of The Big Fight gone out of control”; a praying mantis chomps on a honey bee “as if it were a bhutta” and cleans every barb on its own forearms as if it were “licking off curry trickles”. Many spider-women may be one hundred times larger than their men, sometimes even more, and they are always bingeing, especially on husbands. When a male spider comes courting, he has to make sure he is the date and not the dinner, or at least ensure that he has a date before becoming the dinner. Some bring their dates gifts – a freshly caught fly or cockroach, perhaps, nicely gift-wrapped. While she is busy unwrapping or consuming her “box of chocolates”, he sneaks up to her, does what he has to, and beats it. Others twang dreamy musical notes on the edge of the web as though it were a harp, this lulls the girls into believing that he is but a cute cretin serenading them and not to be eaten, at least until he’s had his fun. At 12 pm every day, a tropical thunderstorm is simulated in this aviary – as most things in Singapore are – but fear not, the walkway running around the aviary does not get showered, only the central “rainforest” part of it does, so you remain dry and bored... The fact that macaws can be taught to race each other on cycles is not what we should be teaching our children about these beautiful birds; these are rare and endangered birds that have their own comic dignity and grace and are not meant to be kept as pets and taught silly tricks. Though Lal has had books published by heavyweights like Penguin India and Puffin, he is very much the retiring writer, someone who’d much rather spend his time on nature walks (or wait for hours for a rare bird to appear within binocular range) than at book events. I met him at his Civil Lines home a few months ago – it was a short, to-the-point visit (I needed his inputs for a story I was doing for City Limits magazine, about literature involving Delhi) and there wasn’t much scope for an indepth conversation. He’s a small man, a little hesitant in his speech at first, but as we got talking he opened up. Soon he was sifting through the many books in his room, pulling out a tattered copy of one of his favourites, Usha Ganguli’s A Guide to the Birds of the Delhi Region, a comprehensive nature study that is sadly out of print today. As I was leaving, I mentioned that I had long thought about joining a bird-watchers’ club myself (for initial information about the best spots in and around Delhi) or making enquires about nature walks but had never got around to it. He gave me the number of someone he knows who organises these things; needless to say, I haven’t called the number yet. Very nice post. I like Lal's books they are a great read, if one is looking for nature reading from India. 'Many Spider Women are hundred times larger than their men'is mirth invoking. I shudder to imagine if the human females were blessed with this trait , we would have huge 100 foot females kicking and beating their husbands for failing to bring the groceries. Imagine the thunderous gossip voices emanating when 'aunties' of the world would converge in parks and recreation centres. I ordered the life n times of altu faltu from roli books. It was available on rediff books even. Your description of Lal's writing reminds me a lot of Gerald Durrell's writing (a favourite of mine). Have you read his : "My family and other animals"? Its a couple of decades old. Does Lal ever mention having read Durrell's work? if you know Ranjit Lal's email, do share with him this "crow" news! definitely sounds like Shri Khatarnak Kala Kaloota Kawwa's doings!! Dec. 14: A crow’s repeated attacks on 60-year-old man has experts flummoxed. Animal behaviour specialists and ornithologists say it is not uncommon for two or more birds to attack possible predators to defend their eggs or hatchlings in what is termed “mobbing”, but say it is extremely rare for a single bird to target one man for so long. The first attack happened when Ravishankar went on the terrace of his house. The crow pecked him and flew away. He thought it was a one-off incident, but the next time he went out of the house, it appeared that the bird was waiting for him to stage some kind of ambush. “We have not been able to figure out why the crow is after me,” said a harried Ravishankar. One of his relatives believe that it could be possessed by the spirit of one of his dead relatives who is trying to settle a grudge. 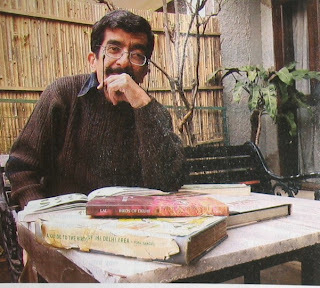 I've been a fan of Ranjit Lal myself ever since I acquired his book "Birds from my window".. I myself am an artist who has been an amateur birder for a while now...and I could very much relate to Mr.Ranjit Lal as he writes his observations with such fondness (not a trace of eruditeness)....about birds and other creatures too...I'm from Bombay myself, but I was in Delhi recently and kept thinking of him when I spotted a lot of birds....and when I returned I re-opened his "Birds from my window", it comforts me and returns me to an innocent love of nature which is sorely missing in today's world..was really happy to see his picture on your blog and maybe I could meet him sometime too, who knows! !